A citywide strike kicks off Wednesday to prevent the privatization of yellow buses. The president of the union representing New York City school bus drivers announced earlier this week that a citywide strike will be starting Wednesday morning. 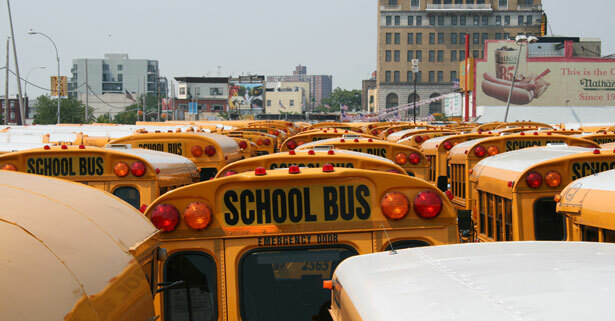 This will be the first time in more than three decades that NYC’s largest union for school bus drivers will strike. Michael Cordiello of Local 1181 of the Amalgamated Transit Union said that more than 8,000 bus drivers and matrons—workers who make sure children get on and off buses safely—would take part in the strike in response to a dispute over job protections in any new bus company contracts for the bus routes. The city wants to cut transportation costs and has put bus contracts with private bus companies up for bid. The union is criticizing lack of employee protections, fearing current drivers may lose their jobs once contracts expire in June. The dispute is simple—it’s about saving money. As New York City schools chancellor David Walcott has noted, the city has operated its school-bus contracts without any “significant competitive bidding” for 33 years. During that time, something called “Employment Protection Provisions” ensured job security for senior workers, even if the city changed bus companies—meaning that experienced drivers were rehired year after year. But the contracts have gotten too pricey; more than twice what Los Angeles pays per student—and the city now plans to offer the contracts to the “lowest responsible bidder.” The union representing the school-bus drivers, Local 1181 of the Amalgamated Transit Union, is asking for Employment Protection Provisions to be included in the new contract to protect workers from losing their jobs to newer, cheaper labor. But due to a state court of appeals decision last year, in which the court ruled to exclude the provisions based on competitive bidding laws, the city says its hands are tied. Part of the significance of this dispute is that while the importance of job protections for current bus drivers is difficult to quantify, the city’s need to reduce the budget is as plain and clear as the budget numbers themselves. In the face of the millions of dollars the city stands to save with cheaper contracts, why should it matter if, for example, 22,500 special-needs students find themselves with brand-new bus drivers one day? It matters because how we treat those who care for certain children reflects how we value those children. It creates a system in which workers entrusted to be responsible for a child’s safety are utterly replaceable in the name of protecting the bottom line. Even though under the city’s strike contingency plans, students, parents, or guardians would receive free MetroCards for mass transit, some politicians immediately rushed to condemn the strike and bus drivers. Greenfield then goes on to use the example of special needs children—not to illustrate the importance of protecting workers’ jobs as Knefel did in the above passage—but to depict striking drivers as being selfish. Valdes-Dapena, the mother of a 10-year-old, told the AP, “I’m concerned about what happens if the drivers lose their seniority, if they’re less experienced. You can teach someone to drive a school bus, but what happens when all hell breaks loose behind them?” She added it takes experience to deal with situations like bus breakdowns, medical emergencies of kids with special needs or traffic, when kids get frustrated or unruly. “The drivers we have now—I’d trust them with my own life,” she said. Any time a labor dispute like this arises, leadership from the top-down rushes to blame selfish workers for putting children in jeopardy rather than addressing issues of job security, privatization and how children are far more likely to suffer under budget cuts and teacher layoffs, while trying to learn in hostile education environments monitored by overworked, under-paid educators, than they are to suffer during a hiatus to settle a labor dispute. Herein lies the false choice. It’s not the children versus the bus drivers, but a choice between living wages and jobs with dignity, and the forces of privatization threatening workers everywhere. For more on less-than-stellar job standards, check out Josh Eidelson’s post on Walmart’s “benefits” for veterans.